Variegata, Variegatum meaning variable coloration with patches of different colors. 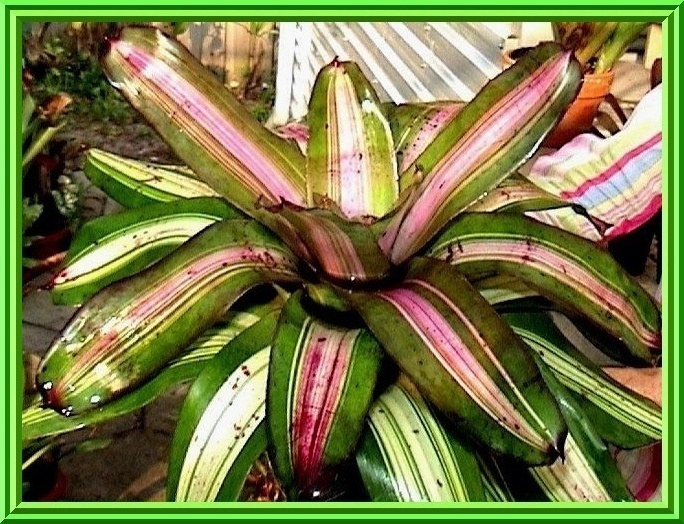 A Bromeliad is known as a "Variegata" when it has two or more different colors. Over 60% of cultivated bromeliads have bands, dots, lines and streaks and can therefore be considered variegated. However, the term is accepted in horticulture when applied to bromeliads that have leaves with lines, streaks and longitudinal bands of contrasting colors, especially those that show differences in pigmentation between the green chlorophyll-containing tissues and the albino tissues. On the other hand, of all the bromeliads that grow in the wild, it appears that all this variegation is a rare phenomenon. As a general rule, patently variegated plants are less hardy and slower growing than normal, and those that form spontaneously in nature normally survive the competition for space and light only when man intervenes, taking them from the wild for cultivation. Variegation is rarely found in the subfamily Pitcairnoideae, and is not common in the Tillandsioideae genera. It does occur however, in the genera Guzmania, Vriesea, Alcantarea and in a few species of Tillandsia. In the subfamily Bromelioideae, variegation is quite common, especially in the genera Aechmea, Ananas, Billbergia, Cryptanthus, Neoregelia, and Nidularium. A. Viruses are common in plants and animals and may cause many harmful and debilitating illnesses. In nature, they provide a quality control system for living organisms. These viroids have the capacity to alter the genetic programming of plant cells by molecular inclusion or extraction of chromosomes. Bromeliads are known to host viruses, but the physiological mechanisms of virus infection in plants is poorly known. B. Viruses may attack the plant meristem or main vascular system. Bromeliads are monocotyledons and as such, they mostly have parallel veins running lengthwise along the leaves. Beginning from a tissue with infected cells, as the plant grows the "problem" is transmitted down the entire leaf, producing clearly defined lines or bands. Variegation that appears in plants grown from seed can be explained by previous infection of the pollen grains. The viruses are often no longer present when the symptoms, variegation..
C. Chemical substances are also capable of producing variegation in plants. It is a well known fact... that flower inducing substances produce lateral buds of the "Variegata" type in adult plants. E. Variegation is also thought to be frequently associated with environmental factors, but there is no scientific proof to back up this assumption. 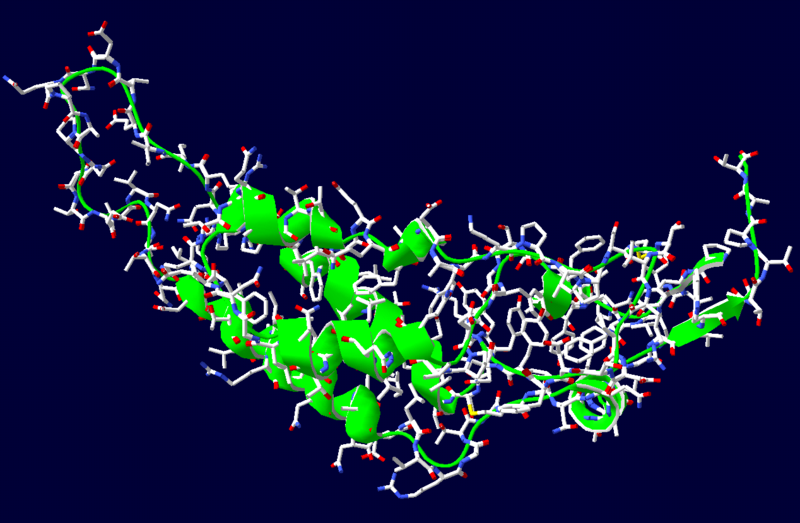 Some investigators support the hypothesis that natural radiation may cause genetic mutation. Laboratory experiments show that B- and X-rays lower the number of meristem cells, which may cause variegation. F. Factors related to microclimate, temperature, humidity and light, are also sometimes mentioned as influencing variegation. Biological stress, such as prolonged dehydration or poor nutrition, is said to bring on variegation, as are ecological disturbances such as fire, flooding, freezing, cyclones, etc. To sum up... variegation may be caused by genetic mutation or by virus infection, but it seems probable that a number of different causes can potentially bring on this effect. Plants with two different types of tissues... albino and chlorophyll - pigmented,Diploid and Tetraploid, are called Chimeras. This defination can be applied to the "Variegatas." Variegation may be fixed or mutable, temporary or permanent. Tissues with fewer chloroplasts leads to white or creme-colored tissues. Variegata... The white or yellow bands have no clear organization, and usually do not extend to the leaf. The term "Variegata" refers generically to any form of variegation (i.e. Nidularium innocentii var. striatum). Marginata... The leaf margins are white Albomatginata or yellow Flavomarginata and the central part of the leaf is green (i.e. Aechmea nudicaulis var. flavomarginata). Lineata... Thin white or yellow lines run along the leaf (i.e. Nidularium innocentii var. lineatum). Medio-Picta... Meaning "Painted Center" this type is similar to "Variegata" but with green stripes in the center of the leaf. Tricolor... Three-colored; usually green, creme and rose color (ex. Neoregelia caroline forma tricolor). Quadricolor... Four-colored; usually white, yellow, red and green (ex. Aechmea magdalenae var. quadricolor). 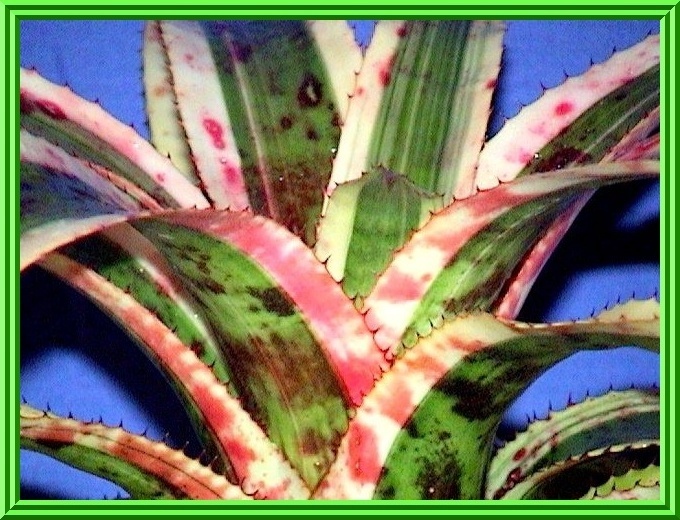 The pigment group known as the Anthocyanins is present in many bromeliads; it is found in the epidermal cells and may hide both chlorophyll-pigmented and albino tissues. In Aechmea orlandiana var. "Ensign" anthocyanin produces a very beautiful red or rose color in the albino tissue. Reddish brown stripes and bands are found in several hybrids such as Aechmea 'Red Ribbion' and Neoregelia 'Amazing Grace'. Variegation is also found sometimes in the inflorescenses, and in primary and floral bracts, such as with some Guzmania hybrids. Vegetative reproduction will lead to the replication of the mother plant, but this method is not totally reliable when dealing with variegates. Even the best lines, the so called "Fixed Clones" may occasionally show some alteration. Some however, have survived for decades without mutations, generation after generation. As a rule, variegated plants are harder to grow than the all green plants. The inflorescences are smaller than normal and the tendency to bud laterally is also reduced. Some have definitely slower growth rates than normal plants. This is especially true of Vrieseas and Guzmanias, which are also slower to take root anyway. It is advisable to leave the lateral shoots on the mother plant for a much longer time than with normal plants. Experience has shown that shoots about half the size of the parent plant can be detached with no problem. An important sign of shoot maturity is root emergence. To promote increased production of laterial shoots, the removal of the newly formed inflorescense is advised, so that the plant can channel its energy into the lateral shoots. Mutable variegate plants tend to produce either albino shoots or all-green shoots. True albinos are apt to die when separated from the mother plant, thus wasting reproductive energy. It is therefore best to remove them as soon as they appear. The Tobacco Mosaic Virus (TMV), which is known to be present in raw, green tobacco was tested on several specimens of bromeliads. In nature, certain types of variegation develop due to viral infections. Researchers at the University of Hawaii have reported that aphids and leafhopper insects transmit potato, cucumber, and papaya mosaic virus to other field crops. Other studies have shown that cigarette smokers have inadvertently transfered the TMV virus while transplanting tomato. The test plants were grown in a shadehouse built of untreated California redwood, located in a backyard home in Honolulu Hawaii. 48% black shadecloth hung 4 feet above the plants. Rainfall averages 18" per year in this location and additional watering from artesian wells. The water was rated "soft" and free from organic and inorganic contaminants. Since the Tobacco Mosaic Virus is also found in Cigars, Wm. Penn Perfecto were used. Each potted bromeliad of the first group was exposed to one inch of cigar per month and was broken apart and spread evenly over the medium, kept moist but not soggy. The second group was treated with an equal volume of small pieces of variegated leaves of Neoregelia carolinae, 'Tricolor' and Neoregelia 'Kahala Dawn' also on a monthly basis. The third "control group" remained untreated. Each of the group of plants was grown separated from each other and the grower is a non-smoker. After one year, four of the five types of bromeliads in the group treated with cigar tobacco showed varying degrees of variegation. Only Neoregelia "Red Gold" did not show any variegation. Of the four types of bromeliads that did have changes, Neoregelia correia-araujoi x Neoregelia 'Oser #100' was the most promising. The variegation in N. correia x N. 'Oser #100' progressed in the first and second gen. of progeny to the point where they resembled the ordered variegation of Neoregelia carolinae 'Tricolor". Five years later, the third and fourth generations of progeny have stabilized with the variegation generalized throughout many of the leaves. The plant is attractive and significantly different from the treated clone. While the commercial value is subjective, the new cultivar has good color, large size, variegation, and adaptability to full sun in the Hawaiian landscape and pups profusely before and after flowering. 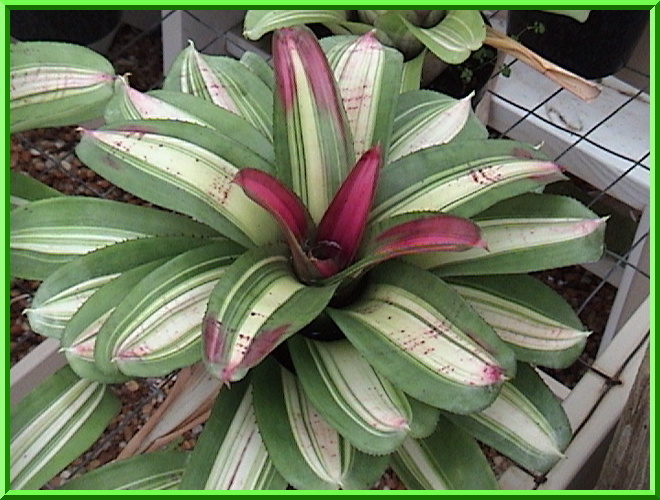 The second group of bromeliads treated with chopped leaves of variegated neoregelias showed no development of variegation. This group was included to test for a persistent viral infestation of variegated plants which might "Infect" other plants to produce the desired variegation. No changes were noted during the test period in the second group. The control group and their subsequent progeny showed no changes in leaf pattern during or after the completion of the study. The tobacco of cigars was an economical and convenient source of TMV for this project. Virus can be transmitted to the growing meristem of bromeliads when tobacco is spread over the potting medium and watered. While the mechanisms of the virus infection remain uncharted, the results of the study indicate its possible to produce variegation in a non-variegated bromeliad and give birth to an attractive neoregelia with commercial potential. Bromeliads are grown as much for their floral variety, with a range of color variegation apparent for the bromeliad leaves. In nature, many forms of variegation have a specific function and aid in the survival of the plant, while other forms have no known benefit. Ananas comosus var. 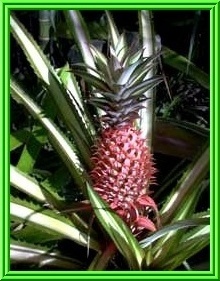 variegatus (Pineapple). This arises from a fusion, or "chimera" of two very different cell types, with white cells arising from a genetic mutation in the growing point of the leaf (Bell 1991). Green sectors contain abundant chlorophyll, but white or pale yellow sectors contain much less pigment. This 'chimeral' type of variegation results in slower growth compared to non-variegated varieties, as only the greener parts of the leaf can photosynthesize sufficiently to provide the sugars and energy for growth and the white sectors consume these resources. Consequently, chimeral variegation is rare in nature, although it persists in horticulture. Other forms of variegation include the more functional 'developmental' variegation, or the appearence of coloration over time. Many Guzmanias and Neoregelias advertise flowers using developmental variegation, with younger leaves becoming red immed-iately before flowering. Variegation may also from bands of leaf hairs traversing the leaf or from variation in the structure of the leaf hairs over the leaf surface, although the function if any of these bands is not known. 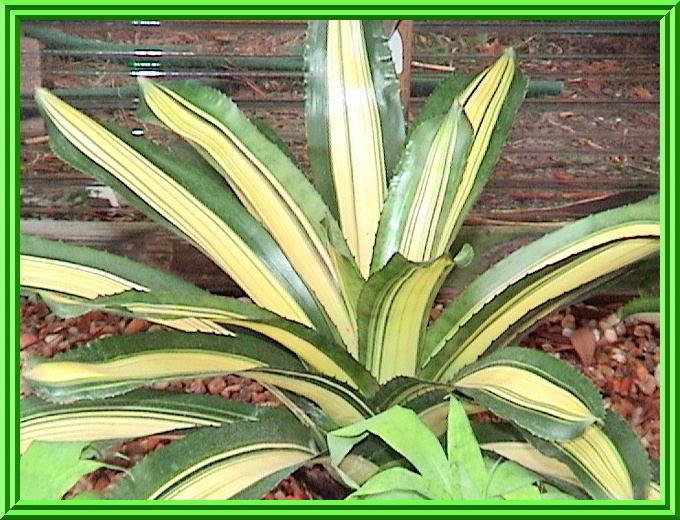 The only form of leaf variegation not shown by bromeliads is "Blister" variegation, in which an air pocket beneath the cuticle pro-duces a paler patch; these structures also have no known function. However, "Discolor" variegation, in which the underside of the leaf is red and the upper surface is green, directly benefits photosynthesis and plant growth. Red undersides to the leaf are thought to act as 'red mirrors' reflecting light back up into the leaf and increasing photosynthesis and growth in shaded conditions. Guzmania musaica var. discolor, grows on the forest floor shaded by foliage and cloud cover, in the cloud forest at Cerro Jefe, central Panama. Guzmania musaica var, concolor (with no variegation), is also found in the same location, but usually grows as an epiphyte. On the lower slopes of the hill, these forms are replaced by a variety with a different form of variegation (i.e. a set pattern determined by particular genes). This pattern is made up of darker and lighter green portions, often also mirrored by the red anthocyanin pigments on the underside of the leaf. As the principal function of leaves is to capture light and carbon dioxide gas, producing energy and structural materials for the plant, any variation in leaf coloration will affect the absorbance of light and the photosynthetic process.